Lenovo Z5 is finally available in the highly anticipated Aurora color - Playfuldroid! When Lenovo took the wrap off their highly anticipated Lenovo Z5 flagship back in June last month, the company has announced 3 different color options for the device namely Blue, Black, as well as Aurora. After releasing the first 2 color variants last month, Lenovo now ready to roll out the new Aurora color option which is something quite similar to the Twilight variant of the Huawei Mate 20 Pro. 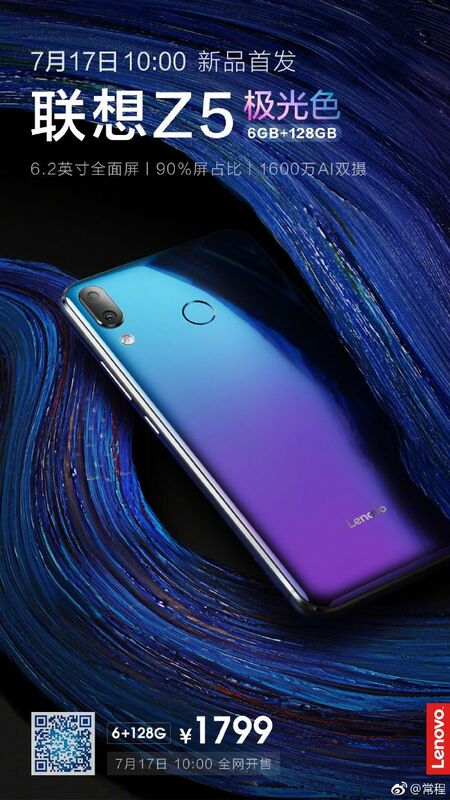 As its name suggests, the Lenovo Z5 will be dressed in a gradient color unlike the Blue and Black ones. Good thing however, is that the Aurora variant will still come with a similar price tag of 1,799 Yuan ($271) for the 6GB+128GB version, even though it was mentioned that the Aurora variant is harder to manufacture as compared to the other standard colors. Sad to say, there will be no Aurora color option available at the moment for the lower-end model with 6GB+64GB memory configuration. As a quick recap, the Lenovo Z5 comes with a 6.2-inches IPS LCD display with 1080 x 2246 pixels screen resolution and an 18:9 tall aspect ratio. The device is driven by a mid-ranger Snapdragon 636 SoC out of the box and runs on ZUI 4.0 atop the Android 8.0 Oreo. Camera-wise, there is a 16MP+8MP dual-camera setup at the back, as well as an 8MP front-facing selfie cam. A 3,300mAh non-removable battery is available under the hood to keep its lights on. For those who’re interested, the device will go on sale starting July 17th in China.